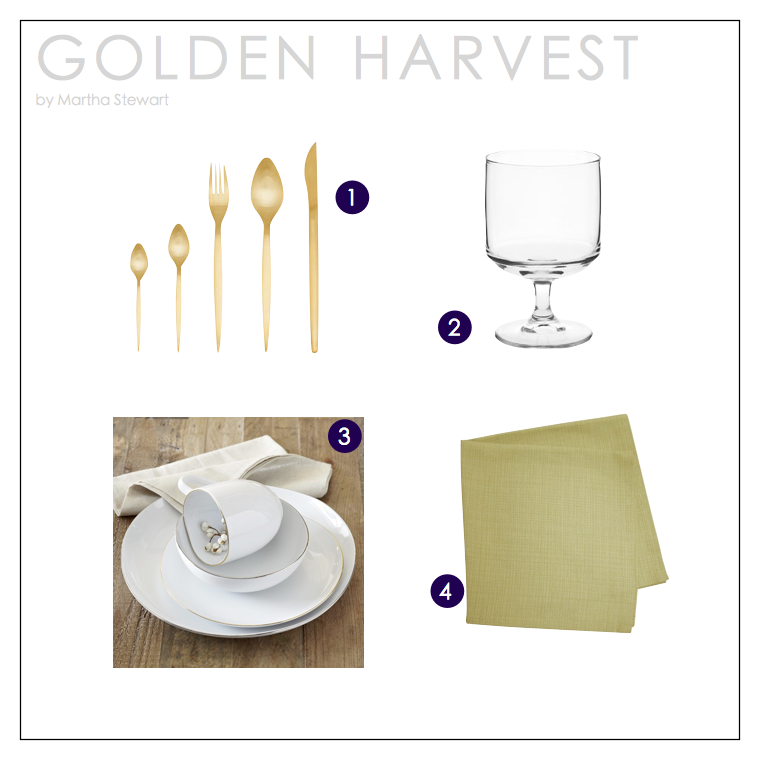 Since this Thursday is Thanksgiving (and I’m planning on being in a self-induced food coma), I thought I’d be proactive and post some early tips and tricks to create the perfect dinner setting for your Thanksgiving meal. I love the idea of a beautiful table setting festively decorated for the holiday. Her are some tips and tricks to give your table setting something special – whatever your style! Organic style is very popular right now, but I think of it more as a classic style rather than an “of-the-moment” trend. You can’t go wrong with elements from nature. Why not take it up a notch and add a modern twist – organic shapes mixed with gold tones and a simple centerpiece. I love this example from the Queen of entertaining, Martha Stewart. Who said drama was a bad thing? Sometimes you need to amp up the “wow” factor and make your surroundings just as amazing as the meal you’re eating. Try pumping up the impact with bold color and pattern, or add some elements that really sparkle. We’re calling it “Modern Glam”, and it’s all about making a statement! Start off setting an overall color palette using bold color combos like coral and indigo or chocolate and black. 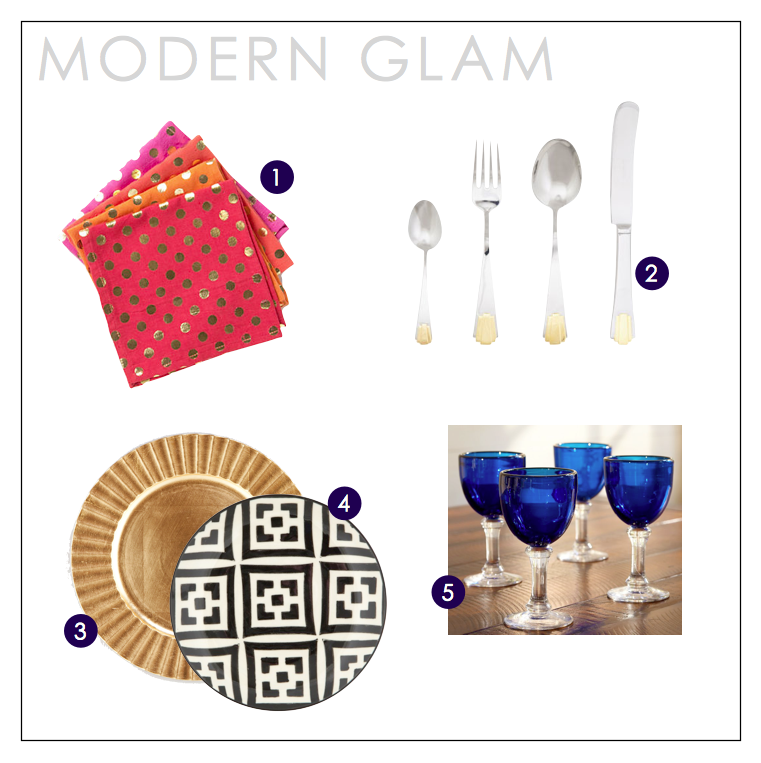 Don’t be afraid to throw in some patterns (I’m in love with the Moroccan plates from Jayson Home!). By pairing large pattern with small ones you can make sure that they don’t compete with each other. Add a little bit of sparkle with gold flatware or colored glass stemware, and finish it out with some bold, fresh flowers. That’s how you add some WOW factor! There’s a reason why the “old standbys” are still around – they are classic and never seem to go out of style. This year, try taking a slightly modern and minimalist approach, and you’ll always come away looking chic (instead of old fashioned!). Pairing the ornate silver flatware and floral dinnerware velvet tablecloth could seem a bit over the top, but the neutral color and subtle texture adds just the right balance to the shimmer and shine of all the other elements (You could even try a burlap tablecloth for an added twist!). 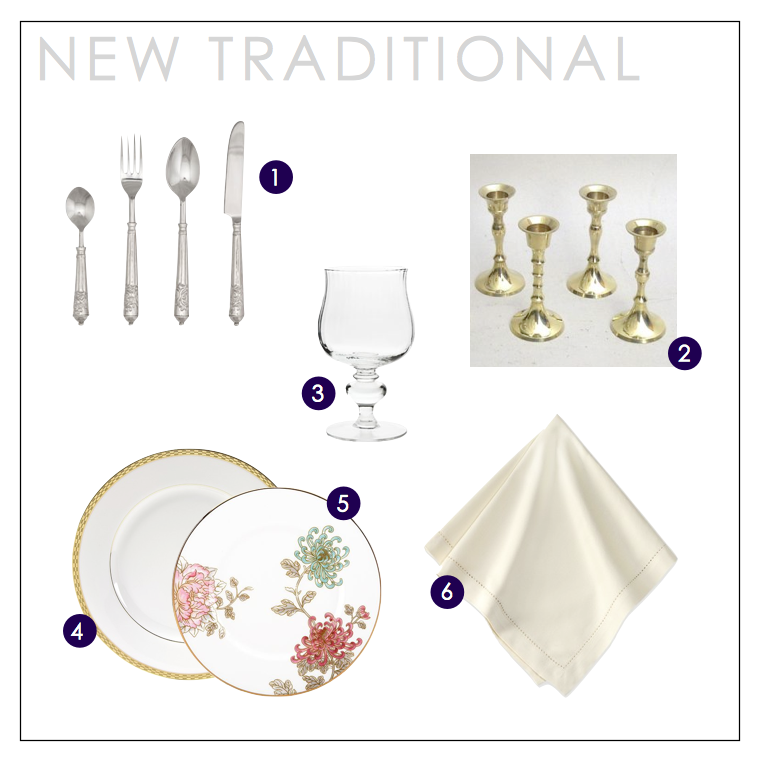 By keeping the stemware simple (along with just a simple gold trimmed chargers), the details in the plates and flatware can make an impact. The color palette keeps things looking light and airy.